Owen Brothers was a reorganization of Palmer & Owen, a Lima, Ohio carriage builder first organized in 1899 by John B. Palmer and Merrill David Owen. John B. Palmer was born in Columbus, Bartholomew County, Indiana in 1859 to George W. Palmer a long time Bartholomew County pension officer who also served two terms as treasurer. At the age of 14 Palmer was apprenticed to the renowned Rochester, New York hearse and carriage builder James Cunningham, Son & Company. Following the completion of his term, Palmer traveled around the country working as a journeyman at some of the Northeast’s largest vehicle manufacturers. In the mid 1880s he found employment with the H. Kaiser Kenton Carriage Works of Kenton, Ohio. This was where he met Merrill David Owen, a Kenton native and blacksmith. In 1887 Palmer married Caroline Kaiser, the daughter of his boss Henry Kaiser, but the business was passed on to Kaiser’s sons, so in 1899 Palmer decided to go into the carriage business with Owen in nearby Lima, Ohio, establishing Palmer & Owen at the rear of the Stamest Block at 121-123 West Market Street, one block west of Lima’s historic Town Square. Merrill David Owen was born in 1870 in Kenton, Hardin County, Ohio to James Owen a stone contractor. David, as he preferred to be called, entered the business world as an apprentice blacksmith with the Champion Fence Company of Kenton. After one and a half years at that firm, he went to work for Pool Brothers, a well-respected Kenton carriage builder dating from 1845. By now Owen was an accomplished blacksmith, and he was employed in that capacity by the H. Kaiser Kenton Carriage Works where he met his mentor and future partner, John B. Palmer. On March 5, 1892, the 21 year-old Owen married Austa Lynch, the daughter of Kenton businessman Alonzo Lynch. The newlyweds spent the next couple of years traveling and working in Washington Court House, Yellow Springs and Defiance, Ohio. They eventually settled in Akron where Owen found employment with the Collins Buggy Co. While in Akron David Owen studied drafting and took a correspondence course in carriage design from the International Correspondence School of Scranton, Pennsylvania. In 1899, he relocated to Lima, Ohio where he entered into a partnership with John B. Palmer as Palmer & Owen, carriage builders. John W. Swan, a Lima machinist and inventor, became connected with the business and in 1902 David Owen’s younger brother Robert D. was brought in as the firm’s superintendent. John W. Swan was a Lima engineer and machinist who in 1902 patented a gasoline engine and starting device which was assigned to the John W. Swan Company of Lima, Ohio; J.O. Hover, president; John W. Swan general manager. In 1905 the John W. Swan Company, Lima, O., changed its name to the Lima Gas Engine Company; J.O. Hover, president; J.C. Pennell vice-president; Edwin Christen secretary; E.F. Edgecomb general manager. An early Lima Gas Engine catalogue shows various Lima natural gas and gasoline-powered engines ranging from 2½ to 100 HP. Lima Gas Engine was later reorganized as the Power Mfg. Co. with G.S. Pike president. Power marketed their engines under the Primm Brand name. Robert D. Owen was born in 1871 Kenton, Hardin County, Ohio to James Owen a stone contractor. He entered the business world as an apprentice blacksmith and worked for a number of northeastern Ohio carriage firms in that capacity before relocating to Lima in 1902 to join his brother in the formation of Owen Brothers. Swan, Owen and Palmer also established the Lima Motor Car Company*, dealers in Peerless and Velie automobiles. *A second seemingly unrelated Lima Motor Car Company was organized in 1919 with $100,000 in capital stock. Shareholders were John J. Wyre, M. L. Johnson, John R. Oarnes, D. H. Wyre, K. A. Werline. Originally located at the Corner of Buckeye and Cherry Alley, it relocated in 1921 to larger quarters at 645 W Market St.
“Natural Gas Exploded the First Day It Was Piped Into Lima From Central Ohio Gas Field. “Lima, O., Nov 28 – Resuming work after the lunch hour, employees of the Palmer & Owen carriage factory, in the heart of the business district, were blown through windows and doors by a terrific explosion that shook near-by buildings. The cause was an accumulation of odorless natural gas which was sent through the mains of the company from the Central Ohio fields for the first time yesterday. “The gas had leaked underground into the factory and accumulated, unknown, until it reached the blacksmith’s forge. “Clever Foresight Strengthens Their Faith in the Future of the Best City on Earth. “New Carriage Firm Owen Brothers to Inaugurate Thoroughly Equipped Plant. 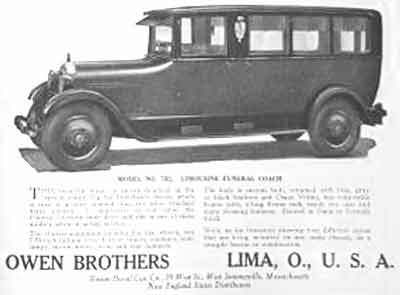 “Another new firm, this time a carriage manufactory of good capacity and under the direct supervision of two of the ablest men in their trade in the state, has faith in Lima’s future and will show the public a line of vehicles for which there will be an ever-increasing demand. “The Times-Democrat refers to the new carriage building firm of Owen Brothers, comprising M.D. and Robert Owen, both carriage men of many years experience. Both are carriage blacksmiths and finished artisans, the former having worked sixteen years at the trade, while the latter has served just one year less than a quarter of century with hammer and anvil. In addition to these accomplishments Mr. M.D. Owen has had fourteen years experience as a draftsman and is a capable designer. For a number of years these gentlemen were members of the carriage firm of Palmer & Owen, but dissolution of the partners having been agreed upon several weeks ago which time the Owen Brothers decided to engage in business on their own account. For some time a suitable location for a factory could not be secured, but eventually they succeeded in securing a lease on the two story brick building directly in the rear of the Times-Democrat, fronting the alley which runs east and west between High and Market Streets, connecting Elizabeth Street with the square. It is also close to the intersection of this alley with the one midway between Main and Elizabeth Streets, and is convenient of access from the Square, from Elizabeth, High, Main or Market Streets. This building was two stories in height and 52 x 52 feet in ground plan. The roof was removed and a third story added, while a number of additional windows were cut in on the first and second floors, until now it its one of the best lighted factory buildings in the city. “The first floor is devoted to the smith shop - or forge room, the wood shop and a commodious stock room. There are two forges of the most modern type, the blast for each being supplied by a smaller circular “blower” operated by a light powered electric motor. A drill press of the latest improvements in mechanical connivances of its kind, is in this shop, also driven by and independent electric motor. In fact Owen Brothers have adopted this practical and business-like method of power supply, each machine, excepting in the wood working department, being driven by its own independent motor of which there are five in the establishment. Another part of the machine equipment of this department is a very heavy and powerful tire bender and former for any and all kinds of curved iron or steel, up into much heavier weights than most machines are capable of handling. “The smith occupies the west half of the first floor, while the wood shop is located in the east half, immediately adjoining and each shop is accessible from the alley by means of large double doors, so that vehicles may be drawn into either for repair. The wood shop is equipped with the best in the form of power band saw, rip or cut-off saw and hub boring and spoke fitting machine. In this department one electric motor will operate all the machinery. “The second floor is devoted to office purposes, a storage room and commodious and well-lighted trimming shop. The office is located in the northeast corner, embracing about one third of the width of the room, while immediately in its rear is the trimming shop, extending to the rear of the building. The remainder of this floor embracing about two-thirds of its entire area. “The third floor is the paint shop and varnish or finishing department, and being above the surrounding building, with windows on all sides is an ideal plan for this class of work, which requires an abundance of light in order to insure the best results. A large “deck” or rubbing sink at the south end of the room supplies plenty of room for rubbing down and washing, the deck being water-tight and connected with the drainage sewer, guarding against dampness on the lower floors. “A mammoth all steel freight elevator, 8x16 feet in size occupies the southwest corner of the building, connecting all floors and facilitating the handling of work of a heavy or bulky nature. Lima’s Owen Brothers (Merrill David and Robert D.) were unrelated to the Cleveland, Ohio Owen Brothers (Raymond M. and Ralph R.) who built the 1899-1901 Owen Gasoline Carriage (and later on the Owen Magnetic). “Six years ago, in a frame building on Sugar Alley, directly south of the rear of the Times-Democrat building, Owen Brothers, a firm composed of David Owen and Robert Owen established a business of repairing vehicles. Today the architects, Leech & Leech are preparing plans for these same Owen Brothers, who by June 1st, 1913, will occupy a brick building of their own located at the corner of Central Avenue and Market Street that will cover 8,400 square feet of ground and stand three floors in height. “From the beginning, efficiency and reasonable charges for their work have been the two cardinal factors upon which their present success stands and there is no job too large for the Owen Brothers to complete and do satisfactorily. "Automobile bodies and tops are two lines in which they specialize, and they are now building a body for William and Davis’ automobile ambulance which will be the peer of any ever constructed. Owen Brothers built coaches from the funeral director's own designs, or the customer could choose from standard models. The company lengthened passenger car chassis especially for their bodies and specialized on Cadillac, Buick and Cole. 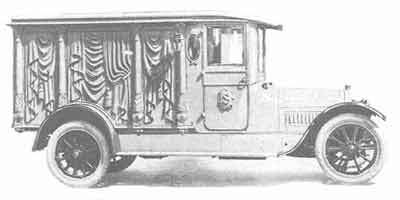 Along with most of their competition, Owen Brothers offered a limousine-style combination pall-bearers coach in 1916 that could be easily converted into an ambulance or hearse by removing its seats. 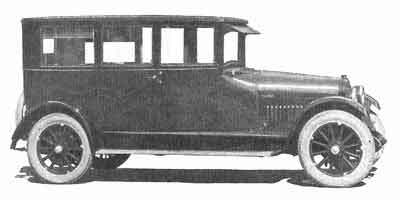 Readymade coaches were available on either a Buick Six or Cadillac Eight chassis. By 1919 Owen Brothers started using a stretched 50hp six-cylinder REO T-6 chassis with a 143" wheelbase for most of their coaches. Owen Brothers also modified existing horse-drawn hearses and placed them on chassis supplied by their customer. These adapted hearses are easy to spot as the roofline and enclosed cabs never match the lines and dimensions of their horse-drawn donors. Some conversions worked and some didn't, but Owen Brother's skilled craftsmen turned out quite a few good-looking converted coaches. 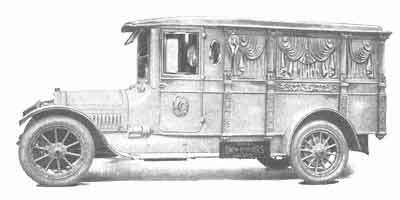 For 1920 Owen Brothers offered a new lower-height 8-column coach with a choice of carved or glass panels. Like Riddle, Owen continued to mount huge 32" coach lamps even at this late date. 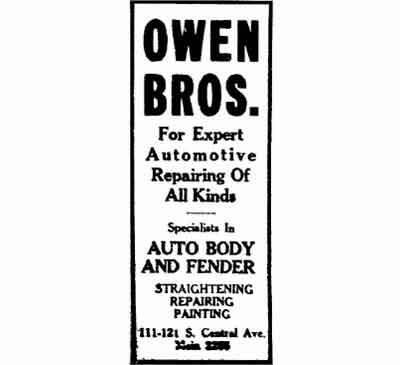 “Owen Bros., 11-121 S. Central Ave, manufacturers of motor hearses and who do general automobile work, have been at their present location eight years. The brick and steel building they occupy was erected in 1913, made necessary when the progressive business outgrew their original quarters at the rear of the present site of the Orpheum Theatre on W. Market St.
“Merrill D. Owen has been a Lima resident longer than his brother, Robert D. The former came here in 1898 and began business in partnership with John Palmer at Market and Union Sts. Carriages were built by then. Palmer & Owen soon found it necessary to find larger quarters. They located in the Stametz Building on West Market St. Another move was made to the Heirick Block nearby. Robert Owen came to the city in 1902 and began as foreman in his brother’s shop. After John Palmer and the senior Owen dissolved partnership, the latter took his brother into the business and for five years they did business at the rear of the Orpheum site. “The Owen Brothers laid the foundation of their success in Kenton, where both were blacksmiths. They are of direct Welsh descent and are active and aggressive business men. “Each year Owen Bros. turn out 125 new motor hearse jobs and the general auto rebuilding, painting, body-making and top-making work is on a scale too large to give figures on the amount turned out annually. An average of 75 motor hearses are rebuilt every year. These jobs are sent to all parts of the United States, as the result of which Owen Bros. enjoy a country-side reputation for their excellence of their work. 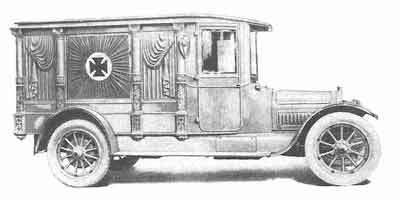 The 1923-1925 Owen Brothers catalogs featured a full line of limousine-style coaches and sedan-ambulances mounted on Cadillac, Dodge, Nash and Studebaker chassis all of which were available as full-time funeral coaches or as combination hearse/ambulances. Like many other small builders, the Owen Brothers coaches that appeared in their 1927 mailers were beginning to look old in the tooth and lacked the modern long & low look of the large manufacturers. In 1928 Owen Brothers introduced re-designed coaches. Very attractive but still not as low and long as the industry leaders, they offered tiny coach lights and leather back styling. Their top of the line Imperial funeral car included large arched windows from front to rear that featured intricate carvings surrounding the top edges of each window as well as dignified two-tone paint and stylish Gordon spare tire covers. All of their coaches were available as either rear or side-loaders and Eureka 3-way casket tables were offered as an option. “Funeral Services for Robert D. Owen, 58, member of the Owen Brothers body manufacturing firm, who died at 10 A.M. Sunday from a heart attack, will be held at 2 P.M. Tuesday at the residence, 626 W. Elm St. Dr. T.B. Roberts, pastor of Trinity M.E. church will officiate. Burial will be in Woodlawn cemetery. “Owen’s physician visited him at 11 P.M. Saturday when he complained of illness. He apparently had recovered Sunday morning and was reading when members of the family noticed that he seemed to be asleep. His physician pronounced death due to an attack of angina pectoris. “Owen was born in Kenton. He had been a partner with his brother, M.D. Owen, for 22 years. The firm has manufactured buggies, ambulance and hearse bodies since 1899. Owen was superintendent in the business when it was run by his brother, J.B. Palmer and John W. Swan. “Just entering the manufacture of hearse and ambulance bodies on a national scale, the firm of Owen Brothers begins the year 1930 with great confidence. The members of the firm predicted Tuesday that by April 1, 1930, the payroll will be tripled and 1930 is expected to prove a year of substantial progress and expansion. “Robert D. Owen, a member of the firm, died unexpectedly last Sunday morning in his home, 626 W. Elm St. Death was attributed to heart disease. “Founded in a very small way in 1903 as a blacksmith shop located at the rear of the old Orpheum theatre on W. Market St., the firm made headway from the very beginning. Shortly after the business was established the firm began the repairing of carriages ad buggies and gradually entered the repair of automobile bodies, specializing in hearse and ambulance bodies. “In 1913 because of the demands of a greatly increased patronage the business was removed to larger quarters. At that time the partners bough the ground located at what is now 111-121 S. Central Ave., and they immediately erected a three-story brick building, in which the business has since been located. The new venture represented an additional expenditure of about $50,000, although the plant is considered worth considerably more than that in 1920. “As a result of a policy of extensive advertising the volume of business has materially increased during the last several years. “Two funeral cars were recently delivered from the Owen shop to the Reo company at Lansing, Mich., and were exhibited at an automobile show there, attended by more than 500 Reo dealers from the central states and Canada. The cars were then shipped to New York City, to be shown at the National Reo Auto Show to be held Jan. 4 to 11. A representative of Owen Brothers will be on hand at the New York display to explain in detail the exclusive and outstanding merits of the Owen bodies. “It was explained that Owen bodies are custom-built and have the reputation of withstanding extremely rough usage. M.D. Owen is the solo designer of the new ultra-modern Owen funeral town car body and ambulance body. “Keeping pace with the modern trend in transportation, the Owen Brothers; Carriage works at 115 S. Central Ave. has emerged from a maker of fine carriages to a manufacturer of high-class funeral coaches and ambulances. This transformation has taken place during a period of 32 years, in which time the firm has always been in control of the Owen family. “The large shop, three stories high and furnishing 40,000 square feet of space, is really a combination of industries. Expert cabinet makers, steel workers, painters and mechanics are required in turning out the products of the firm – machines which are being used in all parts of the United States. “Strangely, the factory, which makes products with which much sentiment is connected, has a quite atmosphere compared with most machine shops. “The first floor is a conglomeration of shops, including the metal working shop, the repair department, stock room and show room, besides the general offices. “In the metal working shop, with the aid of electrically driven stamping hammer, the large sheets of steel are hammered into the shapes required for the bodies of the funeral coaches and ambulances. Most metal shops roll the sheet into the desired shapes but Owen Brothers feel that hammering produces a better product. This hammer pounds away at the rate of 1,000 blows per minute, shrinking the metal into rounded shapes. “The stock room is adjacent to the repair room, where bodies of all types of cars are repaired. Expert mechanics rebuild bodies that have been damaged in accidents or change designs that are slightly out-of-date. “In the wood working shop on the second floor, the bodies for the machines are constructed by men who have made a scientific study of this work. The doors and roofs for the standard bodies are constructed over jigs, making repairs possible without extensive alterations. Only the best of ash lumber is used, the required shapes being obtained through the use of power saws. Other workers on this floor assemble the body frames, binding the parts together with screws and strong glue. “The third floor includes the paint shop, where all the bodies are given a process paint finish when completed, and storeroom for stock bodies and machines being repaired or redesigned. “About 40 men are now employed by the firm, which includes 55 employees when operating at capacity. “The Owen Bros. Carriage Works came into being in 1898 when a small shop was set up in what is now the back end of the State theatre for the manufacture of fine horse carriages. M.D. Owen, the present manager of the firm, and his brother, the late Robert Owen, who died last December, were the founders of the company. Owen Bros. carriages enjoyed an enviable reputation during the early part of the 20th century. “When the automobile age dawned and the demand for horse vehicles decreased, the firm turned to the manufacture of automobile bodies and in 1915 erected and moved into the present structure. The manufacturer of high-class funeral coaches and ambulances displaced the old carriages, many of which are now included in historical displays throughout the country. “About 125 new machines are turned out each year, in addition to the repair work. M.D. Owen said. A large part of this new work is for the Reo Motor Co., which does an extensive business in funeral coaches and ambulances. The chassis are shipped to the local factory and the completed product is sent to Reo dealers in various parts of the country. “Four standard funeral coach designs are made by Owen Bros. and these are fitted on Reo, Packard and Cadillac chassis. One of the recently added machines is a Packard town car ambulance, which is being favorably received, especially in the eastern states. “Corporate Papers Are Granted Owen Bros.
Owen Brothers built one memorable coach in 1930 on a stretched front-wheel-drive Cord L-29 chassis. The low height of the Cord's chassis made the Owen ambulance body appear top-heavy, especially when compared to contemporary Kissel and Henney coaches. Another Cord L-29 ambulance with a white body and black fenders was originally owned by Frank A. Hornstein of Aliquippa, PA and was allegedly built in 1934 by Owen Bros., possibly on a used L-29 chassis - as was the custom at the time. These Owen Bros. coaches are two of only five L-29-based professional cars known to have been built. The ongoing Depression took its toll on the firm and the firm’s contract with Reo ended when the automaker halted production of their 152 inch wheelbase chassis. Through the remainder of the decade the firm kept busy through general auto body repair, commercial work and remounting used chassis with new or remodeled coach bodies. Owen’s swan song was two side-loading ambulances they constructed during 1936-37 on the Cord 810/812 chassis. The first, a 1936 810, was for their Lima, Ohio neighbor, the Bowersock and Chiles Funeral and Ambulance Service, the second, a 1937 812, was ordered by an Athens, Ohio livery service operator named Jaeger. Built using stock 4-door 810/812 sedans, Owen Bros. cut them in half just behind the B-pillar and inserted a hand-constructed center section between the two pieces, just as today's modern stretch limousines are constructed. Painted white, the Bowersox & Chiles car was sold in 1942 to a firm in Auburn, Indiana. According to Kit Foster, it re-appeared in the Champaign/Urbana Illinois area in 1964 and was turned back into a stock 810 Westchester sedan. The Jaeger Cord 812 turned up for sale during the early- to mid-50's and Bernie DeWinter IV learned that it was subsequently destroyed in an accident on Route 35, east of Dayton, after speaking to the purchaser of the wrecked coaches' salvaged motor. The two Cord 810/812 were the last known Owen Brothers conversions offered to the trade, although the firm remained in business at least through 1948 doing auto body repair and painting. Their 111-121 S. Central Ave. factory still exists and has been occupied continuously by various automotive repair businesses. © 2004 Mark Theobald - Coachbuilt.com, with special thanks to Bernie DeWinter IV and Thomas A. McPherson.